Main Street clients are immersed in a comprehensive wealth management plan. 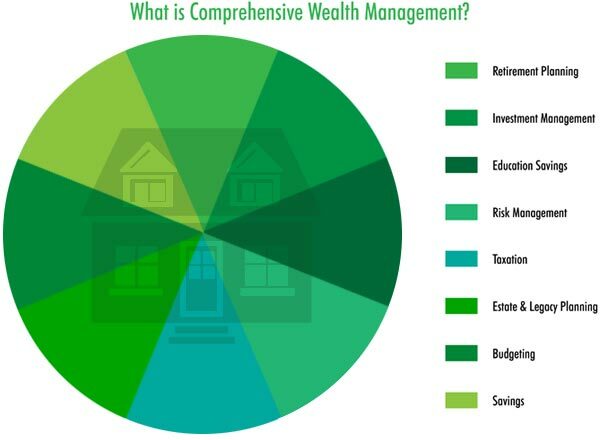 What is comprehensive wealth management? Not only do I help clients with every aspect of their finances and investments, but my wealth management program is a financial wellness plan that increases accountability, measurement and proactive planning to maximize client wealth. The Main Street program means that clients can expect to have regular meetings with their advisors during which a holistic financial action plan is built specific to their needs and circumstances. Most advisors contact clients around Christmastime for a simple “check-in” (usually with the intention of selling additional, commission-based products). I ensure that our meetings have prepared agendas and are documented with detailed reports containing real and actionable steps to implement the recommendations. This helps ensure both client and advisor accountability. For new clients, the first step in the program is a calculation and graphical depiction of their current financial status. This includes a calculation of net worth, an immediate risk assessment of their investment and retirement portfolios, and useful financial comparisons to the client’s peer group. The resulting figures and ratios allow the client and advisor to measure client progress towards their individual goals throughout the relationship. Step two in the program is a comprehensive, in-depth risk assessment of the client’s investment portfolio, insurance coverage, assets and debts. Based on risk tolerance surveys, time horizons and client goals the advisor and the client then build an Investment Policy Statement (IPS). The IPS will guide the long-term investment of the client’s portfolio and help both the client and their advisor monitor and, if need be, make changes to the investment mix. A thorough review of the client’s insurance portfolio helps highlight latent risks and helps assess the affordability and ultimate need of coverage. The next step is the implementation phase of the action items in order to begin moving the client toward their goals. Again, it is here that my methodology shows its value, namely through documentation, accountability, and frequent follow-up. Main Street clients can expect to be given the tools, education, and coaching that they need in order to succeed in their financial goals. The last step in the process is monitoring, measurement and, if necessary, making small adjustments. Main Street Investments agrees to watch client portfolios and ensure that the investments do not deviate too far from their agreed-upon path. Clients are provided with regular updates, advice, tips and communications to help mitigate the risks of their goals not being achieved. In short, my money program, combined with my low management fee, means that Main Street investors can rest assured that their advisor is solely concerned with maximizing their wealth.